Yesterday we lost one of the true great comedians of the 20th century. Gene Wilder, best known for playing Willy Wonka in Willy Wonka and the Chocolate Factory, has died at the age of 83 from complications from Alzheimer’s disease. Gene Wilder was a genius and liked to work with geniuses as well. His first film was Bonnie and Clyde and it was this film that made Mel Brooks hire him for The Producers. Wilder's work in the film should had garnered him an Oscar, but it did not. The first time I saw Wilder in a film was in Willy Wonka and the Chocolate Factory and his performance made me want to seek out other films that he was in. He is snarky and opinionated and funny as hell. He was so good in the film that no one has been able to top him. Blazing Saddles and Young Frankenstein were the last two films that Wilder would do with Brooks and they made the films the funniest they could. The films are classics today and would not be without Wilder in them. There is just something funny about the way Wilder makes each role his own. From the pronunciation of Frankenstein (it's Fronkensteen!!) to the laid back nature of his role in Saddles. After working with Brooks, Wilder found a new partner in crime: Richard Pryor. The duo would go on to star in four films together: Silver Streak, Stir Crazy, See No Evil Hear No Evil, and Another You. I remember when Another You was released, the critics hated it. All they could talk about was how far the two had (supposedly) fallen, in terms of comedic talent. The two were still very talented and still loved working with each other, but they both knew that their time in front of the camera was running out. Pryor had MS and Wilder was wanted to do more tv work. They did Another You because they wanted to do one more film together. They didn't care if the film was good or bad, they got to make each other, and everyone around them, one more time together. I think that Another You is not that great of a film, but it doesn't matter. Watch the film with the knowledge that they are two friends saying goodbye to each other and the film takes on a whole new meaning. It still isn't funny, but there is a lot of heart in the film and sometimes that is all it takes to make a film special. Wilder starred in a short lived sitcom called Something Wilder. I don't remember the show outside of my mother being sad that the show had been cancelled. She was a huge fan of Wilder. The last thing that Wilder did was just last year. He did a voice for The Yo Gabba Gabba! Movie 2. Any time that Gene Wilder would show up on camera, you knew that there would be laughs. The man knew how to take a mundane thing and make it funny. He starred in many films and his best work was when he had someone who was just as funny as him to work off of. This gave us the classics mentioned above and it gave us so many laughs. 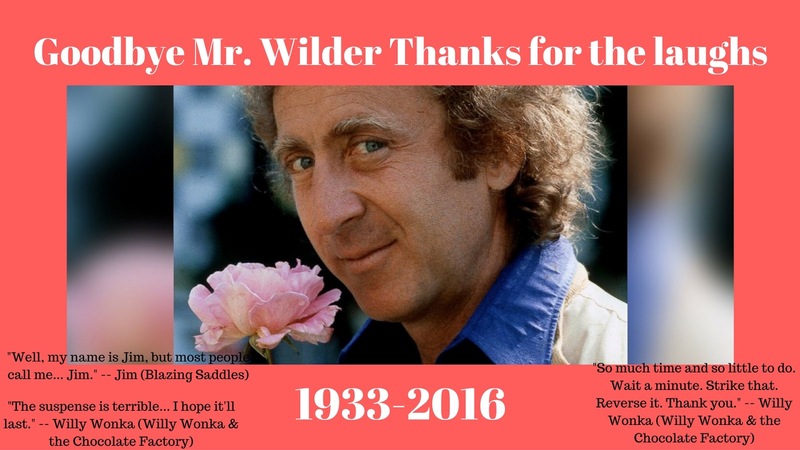 We have the films to remember Wilder by and will miss him every time we watch one. God speed Mr. Wilder.